Translated from Thierry Noisette’s French article published on ZDNet.fr, with the author’s authorization. Numbers are unflattering towards Open Source software: women represent 28% of proprietary software developers, against … 1,5 to 2% in Open Source software (see in particular the sources listed in Angela Byron (Drupal)’s excellent June presentation, PDF 139 pages: “Women in Open Source“). This imbalance is not systematic – an example amongst others is the Mozilla Foundation, led by Mitchell Baker, who furthermore received the Woman of Vision Award from the Anita Borg Institute for Women and Technology in May. This Framablog post written in October 2008 is a must-read: “Women and Free Software” (in French). 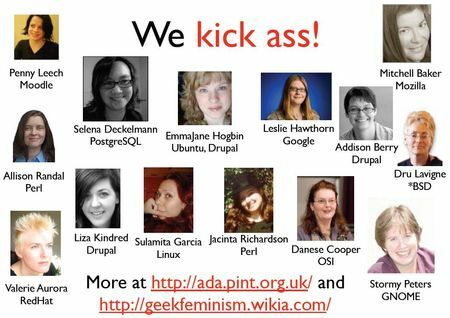 Image from «Women in open source», by Angela Byron (Drupal): Yes, there are women in FLOSS! Also, several FOSS women – Deborah Nicholson from the Free Software Foundation (FSF), Stormy Peters from the GNOME Foundation, and Hillary Rettig, Free Software activist and author of The Lifelong Activist (and of this interview of an “activist throughout his life”, Richard Stallman) – have recently organized a ” mini-summit “ around the women in free software issue, on September 19th. Purpose of the “Women in Free Software” meeting? Discuss ways to increase female participation amongst communities of developers and free software advocates. The first notes from this meeting can be found online here. Were present: Mairin Duffy (Red Hat and Fedora), Leslie Hawthorn (Google), Adelaida McIntire (FSF), Deborah Nicholson (FSF), Hillary Rettig, Christine Spang (MIT, Debian), Hanna Wallach (Debian Women, GNOME) and Marina Zhurakhinskaya (GNOME), and the more remote Stormy Peters (GNOME). The group has started a wiki, prior to a FSF campaign around the issue and to the Free Planet Conference that will be held in Boston in six months.